The Jockey Club at Buenos Aires is located at San Isidro and it’s an exclusive club that attracts the capital’s best-heeled golfers as well those more interested in horse racing and polo. Founded way back in 1882, the Jockey Club started out in life as an organisation to control horseracing at a national level, as well as an active social centre. There are two courses at the Jockey Club, the Red (Colorada) and the Blue (Azul), both of which were designed by Alister MacKenzie and both opened for play in 1935, a year after his death. The Red course played host to the World Cup of Golf in 1970 with the Australian team winning the team title after David Graham finished second and Bruce Devlin third. Argentinean folk hero Roberto de Vicenzo delighted the local crowds by winning the individual title and, in doing so, became a legend at the Jockey Club. The Red course is laid out at sea level over predominately flat ground and to break up the monotony, MacKenzie built mounds and contouring coupled with subtle but strategic bunkering. At 6,700 yards in length, the Jockey Club’s Red course is by no means long but it’s a tricky layout on which to score well. Perhaps the signature hole is the wonderful one-shot 17th which is a classic example of MacKenzie’s genius. The long, narrow and raised green is beautifully guarded on the left by two angled bunkers making the tee shot a serious challenge, especially when the pin is positioned on the left side. Angel Cabrera thrilled the country when he won the 2001 Open de Argentina by two shots from Sweden’s Carl Pettersson. This was Cabrera’s first European Tour victory and the birth of another Jockey Club legend. Muchos la llaman, la “joya de la arquitectura”, diseñada por Alister MacKenzie, también diseñador junto a Bobby Jones del Augusta National Golf Club. A tan solo 25 minutos del centro de la Ciudad de Buenos Aires, El Jockey Club se caracteriza por sus grandes greens en forma de platos invertidos y protegidos por grandes bunkers laterales. Posee una gran variedad de árboles, en su mayoría pinos, lo que no impide que en algunos hoyos su trazado sea abierto. Su similitud en algunos hoyos a canchas como St Andrews o North Berwick hacen que cada hoyo sea un difícil desafío pero a la vez entretenido. Es imperdible el hoyo 10 de la cancha colorada, un par 5 no muy largo pero que aun a los largos pegadores suele dar problemas. El green tiene una barranca muy pronunciada que rechaza los approachs que no se juegan con alta precisión. Inaugurada en 1928, fue sede de la Copa del Mundo en 1962 y 1970, y del Abierto de la Republica en 16 ocasiones. También se disputo en ella el 100º Campeonato Argentino de Aficionados y el 100º Campeonato Argentino de Interclubes. I think this is my first true Mackenzie Course. Now, I think if you dropped me onto any of his courses blindfolded, I think I would be able to tell you he designed it. It is a true test of technique, confidence and strategy. Vast swathes of green only exist to carry the ball away from the hole. You had better approach from the right angle for an easier shot. The more out of position you are the harder it becomes. He has a design language all of his own and asks you a very different question to most other designers. The greens are contrived in every regard. Too bold? Hello big drop off. too shy? Back to your feet. Once again the flat land on which the Jockey club sits demands design. Alister did not let them down. His little Islands of magnificent elegance represent green complexes that sit starkly on the plain. Take them away and you have 3 ball course. I soooo want another go though, you cant do well first time around. It is an education on your first trip. Subtle, brutal, eloquent, I was not sure at first but by the end I was won over. I have now had a glimpse of what the fuss about Augusta, Cypress point etc is really all about. A player must think about the game in a completely different way here. A bold near miss will be very costly but a conservative strategy might avert disaster without yielding a great score. What would you do? instagram the_bareoot_golfer Huge Thanks to Lance, Dan and Josef. Brought together ona wonderful Day by, you guessed it, Javier of Wegolfargentina. Wow. What. A. Trip! Just the day after playing the All Blacks in Nordelta I was hosted by member Mario to make Jeff "Goldie" Wilson, former All Black legend at the famous Red. The current players are not allowed to walk courses in competition season, but Goldie as a journalist yes! So I told the chance to make him experience our most traditional golf course, imagined by Dr Mackenzie 85 years ago. It was a sunny day and member Jaime and Goldie tied a great match with Mario and Me, after we won the last two holes. Jeff, a good 5 hcp was -1 on 14th before 3 bogeys led him to a very good 74. Course was in very good conditions, greens still with the mix of some rye grass rolling firm and at a very good speed. Trees starting to bloom so the scenery was excellent to show Jeff one of our jewels. And of course he tasted the 11th Hole Half Way hot dog, one of the trade marks of the Club. I know it is said that the course has lost some of Mackenzie's original features due to excess of bunkers and trees, but the Club Committee is slowly taking it back where it should have not left. Lunch at the Club House makes it a complete experience for visitors and Mario took care that Goldie had it in full visiting the entire Club House. It is a course that may not be mantained as Augusta, challenging as Pine Valley or Scenic as Cypress Point but it holds a big piece of argentine golf history and it is well worth a visit! The Jockey Club carries much history, cache in the local sporting scene, and atmosphere, which creates a great sense of occasion by the time one is on the first tee. To dispense with the qualifiers first, as is mentioned in reviews here and elsewhere, parts of the front nine are tight, maintenance could be touched up a bit befitting the club’s lineage and status (but, to be clear, the course I played was in good shape), and undoubtedly some of the architect’s detailed planning has been lost over years of maintenance. Now for the good part. What a course. The front starts out fine, then a lull, but the course picks up steam as you move along. In particular, holes 14 through 18 crescendo to a fantastic finish. Whether or not the design has been softened, you can feel an inspirational MacKenzie course beneath your feet, and on the back nine you can clearly see it. I flew a continent away to play this course, and it was worth the pilgrimage. I can’t imagine what they would have if the course engaged an expert to fully create and restore the MacKenzie design. On a side note, weirdly, my loafers went missing during the round, but my softspikes served me well walking through Palermo Soho later, all of which added to what was already a special day. A must play for those that enjoy great design and will recognize very interesting Alister MacKenzie features. The extremely flat sight resulted in Mackenzie creating some aggressive mounding and elevated green complexes with severe counters. The Jockey defends par mostly on the greens, with tough chipping and putting tests. I enjoy the Blue course nearly as much as the famed Red course. Having said tihs, the Jockey suffers from lack of space, with some holes crammed against high fences onto roads or the race track. Some of these holes are not interesting, playing too narrow or too short and devoid of strategy. Maintenance is a problem, with several areas of ground under repair,and no grass, especially around some greens where foot traffic has taken its toll. Unfortunately bunker edges are maintained without regards to the original design, and their look is bland. I observed unqualified workers cutting the edges with spades. The quality of the greens was also no the best when I played, bumpy. Finally, there is excess trees on the property which negate some of the original strategic intent of Mackenzie.This is a course that could be magnificent with the proper renovation and the addition of 2 acres of land on the front 9. Alister MacKenzie designed both Red and Blue Courses, although the first one is far better design. Usually hosts Argentine Open, when prepared for this event holes 4 and 11 are switched to par 4s for a very difficult par 70 layout. Narrow fairways, big greens in the shape of inverted dishes, rough is also a factor. Green #18 is from were Dr Duncan took a sample to create all the variety of paspalums he has been working on. My favourites? 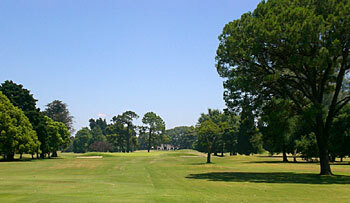 Long par 3 #8, challenging short par 5 #10 and fabulous finishing hole, a short tricky par 4. If you come to Argentina, this course MUST be on your list, although maintenance is not at the highest level today. Yes this is a MUST play. Interesting design and while it is a bit rough around the edges, the course is a joy to play and when one watches the Masters you can see bits of the Red Course in the design of Augusta.